Breakaway lanyards break apart if pulled, snagged or caught offering added safety. Adjustable slide allows breakaway clasp to be positioned where you want it. 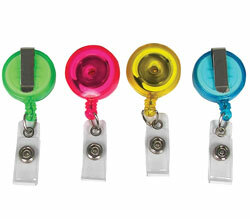 Swivel hook attaches to ID cards, keys or badge holders. Made of durable, flat woven material. 3/8 in. wide x 36 in. long. Black.